Free Solo climbing is rock climbing without any rope or technical aids. A fall will most likely end fatally, therefore Free Solo climbers are absolute experts in their field. Free climbing is not a one shot action. It requires a lot of training where MAXIM® Climbing Ropes play a big wall, as well as total concentration, physical strength and mental power. Alex Honnold, one of MAXIM’s top climbers the “Master” of Free Solo climbing. In 2016 he free solod Freerider on El Capitan in less than four hours. We are always being asked why Alex Honnold is on the MAXIM® Team when he is known for free climbing? Simply said – training is the road to success. Before being able to climb a route free solo, it is crucial to know every part of the route by heart and you would always be better off taking a rope with you when you the first 50 tries. For all of you who are inspired by Alex Honnold and his free climbing projects, get The Alex Honnold series of MAXIM® Ropes. 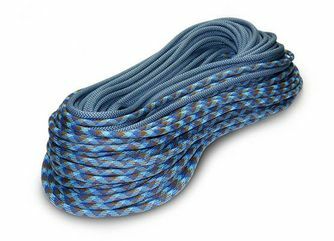 These ropes were developed together with Alex Honnold and are available exclusively at REI.